The architecture of this ancient country is one of the most fascinating parts of not just ancient Egypt’s history but the history of the world. The Egyptian’s constructed grand temples and pyramids which have survived the ravages of time and continue to attract the attention of scientists and common people alike. Most ancient Egyptian architecture was inspired from the theology of ancient Egypt which was mainly polytheistic, although during later times of the Egyptian empire monotheism was introduced. Some of the most magnificent masterpieces of ancient Egyptian architecture include the Pyramid of Giza, the Great Sphinx of Giza, and the famous Temple of Horus. Preliminary forms of ancient Egyptian architecture existed from the beginning of the Egyptian kingdom as early as 3150 BC. However, structures of importance began to be constructed mainly during the Second and Third Dynasties, around 2700 BC. It was during this time of that step pyramids began to be constructed which eventually became the precursors of the later actual pyramids. The Pyramid of Giza and the Great Sphinx were constructed around 2600 BC during the Fourth Dynasty. The practice of constructing grand pyramids in ancient Egypt ceased around 1700 BC but other structures continued to be built. For instance, the famous Temple of Edfu was built during the Ptolemaic Period which fell between 237 BC and 57 BC. Perhaps the chief characteristic of ancient Egyptian architecture was the conspicuous absence of wood in the structures. This was because Egypt was a dry land and it was not possible to find abundant wood to use in construction, other materials such as sun-baked mud brick and limestone were therefore used. Common houses were built from mud extracted from the Nile River. The ancient Egyptian architecture of grand religious monuments and temples has a few common characteristics as well, for instance, they had thick and sloping walls with only a few openings. Huge stone blocks were used in to construct flat roofs of temples and these roofs were supported by large beams and columns. Ancient Egyptian architecture was fairly advanced with respect to building standards and techniques used at the time. A mixture of the diverse range of architecture created during the ancient Egyptian periods. The most common building materials that were used in ancient Egyptian architecture were sun-baked mud bricks and stones. Limestone was the primary form of stone used in architecture, although sandstone and granite were also frequently used. Eventually, stone became to be used almost exclusively for temples and tombs while houses and even palaces were constructed with bricks. One of the most important features of ancient Egyptian architecture is that no wood was used in construction. Various innovative construction techniques and methods were employed for ancient Egyptian architecture. Since there is a difference in the construction of earlier and later buildings, particularly the pyramids, it is clear that these techniques evolved over time. Various hypotheses exist for the construction methods that were employed for ancient Egyptian architecture. The central problem to be tackled was to move the large blocks of stone across the desert. Special tools were used to cut the stones in the quarries. The generally accepted hypothesis for the transportation of these stones to the construction sites is that sledges used to transport these stones were lubricated by water which made it easier to drag the large weight on the sand. However it is still not known conclusively exactly how the Egyptians managed to build such precise and sophisticated structures which would be challenging even with modern technology. Names of various famous architects of ancient Egyptian architecture can be found in historical records. One of the most famous architects was Amenhotep who was also a priest and a scribe. He was born during the reign of Thutmose III and supervised the construction of various famous monuments, including the Colossi of Memnon. Other famous architects of ancient Egyptian architecture included Amenhotep III who was also the ninth pharaoh of the Eighteenth Dynasty, Imhotep, and Senenmut etc. The temple of Luksor displaying the intricate details in many example of ancient Egyptian architecture. A wide variety of famous Egyptian architecture has survived the intervening centuries and continues to be included in the wonders of the ancient world. The most obvious examples are the Great Pyramid of Giza and the Great Sphinx which were built around 2500 BC during the reign of pharaoh Khafire. The Great Pyramid of Khufu is another architectural wonder of ancient Egyptian architecture and was built by Pharaoh Khufu. 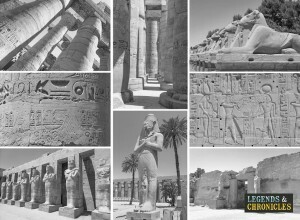 Other noteworthy examples of ancient Egyptian architecture include the religious site of Karnak with its giant columns, the rock temple of Abu Simbel, Valley of the Kings, Red Pyramid, Luxor Temple, Step Pyramid of Djoser, the Mortuary temple of Hatshepsut, and others. These great structures of ancient Egyptian architecture continue to be a source of fascination for people of all ages. The main emphasis that was given to the construction in their architecture was the building of temples and grand buildings. The most important examples are the pyramids which served as the burial site for the pharaohs. Among the temples, The Mortuary temple of Hatshepsut is noteworthy which is located on the west bank of the Nile. It was constructed during the reign of the Pharaoh Hatshepsut and the construction was overlooked by the royal architect named Senenmut. The temple consists of three layered terraces which reach to the height of about 97 feet. 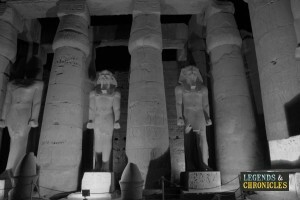 Another example is the Luxor Temple in the ancient city of Thebes. This temple was dedicated to three Egyptian gods named Amun, Mut, and Chons. Other grand religious constructions of architecture include the Temple of Abu Simbel and the religious site of Karnak. Ancient Egyptian architecture is the most fascinating and awesome architecture of the ancient world and it is hard to find any other examples during the same era. The main driving force behind the construction of these monuments, temples, and pyramids was the religious beliefs of the ancient Egyptians. For instance, the pyramids served as the burial sites of the pharaohs and the temples were dedicated to various gods of ancient Egypt. Various kinds of materials including stones and bricks were used in the construction of these buildings, however, wood is conspicuously missing from ancient Egyptian architecture because Egypt was a dry land and procuring massive amounts of wood for construction was not possible.